Mini Book Expo and author David Desmond were kind enough to provide me with a copy of The Misadventures of Oliver Booth. Have you heard of this book yet? This book is highly entertaining. 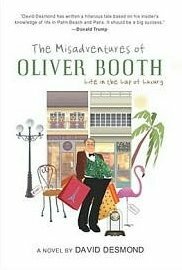 Oliver Booth is basically a “wannabe”, for lack of a better term. His opinion of himself does not match that of others and it’s a constant source of entertainment for the reader. The book takes us through numerous misadventures…most of which take place in Paris as he and his assistant Bernard, attempt to select antiques for a wealthy Palm Beach resident. At 202 pages, this was a very quick read. My only criticism really is that as obnoxious as Oliver was, I wanted to read more about him! At one point the story began to focus more on Bernard, his assistant and I was anxious for it to get back to Oliver, which of course it did. Desmond did an excellent job of creating a character that you can laugh at, yet not dislike so horribly that you cannot stand to read about him. Overall it was light and fun and there were several moments that I found quite humorous. If you’d like to read more about the book and David Desmond, check out the books’ website by clicking here. I’ve got this one coming – glad to see it’s entertaining. I’ve never heard of this book Ti but it does sound like a fun read. Great review.